That was 3 hours of heart wrenching horribleness that pretty much will make anyone lose their faith in humanity. And I loved every second of it. Spoilers to follow. After a "previously on" segment (started by Lee), the game picks up a few months after the last season. Clementine has met up with Christa and Omid (the two shadows from the end of last season) and Christa is much more noticeably pregnant. They stop at a rest area to rest and clean up. And of course, in true Walking Dead fashion, tragedy strikes when you least expect it. Another survivor is able to sneak up and take Clementine's gun and threatens her to hand over everything she has. That's when Omid enters the rest room. When the door closes shut the other survivor is startled, accidentally shooting Omid in the chest when she turns to see what made the noise. And of course Christa hears it and comes running. The survivor is visibly shaken by what she's done, drops the gun and puts her hands up. That doesn't stop Christa from killing her with a shot to the stomach before cradling Omid as he dies. I love how in just the last 10 seconds of this scene you are able to get so much about how the characters feel, just through their facial expressions. You can tell right away that Clementine blames herself for his death, and that on some level, so does Christa. The game cuts to 16 months later. Clementine is noticeably older, and Christa is no longer pregnant. What happens to the baby is never explained, but I think it's a safe bet to say the poor thing didn't make it. As they sit around their campfire, cooking a weasel they had caught, Christa tells Clementine that it'll be safer once they get north, where the cold and inclement weather means fewer walkers to deal with. I have many problems with this plan, but I'll save that for later. Eventually, Christa goes to get more firewood to keep their camp fire going. When the fire dies down a bit, Clementine digs through her back pack for her lighter. She finds the picture of Lee and looks at it sadly. I know, I miss him too, Clem. Then she finds the drawing she did of Kenny, Katjaa, and Duck and does the same. She finds her lighter and, using the last piece of collected firewood, gets the fire going again. After, Clementine hears a disturbance in the woods and sees Christa being held at gunpoint by two bandits. After deciding whether or not to distract the bandits to help Christa, one of them chases Clementine through the woods and tries to grab her. She manages to break free and pushes him into the reach of walkers. As more Walkers close in on her, she accidentally backs up and falls into a nearby river, taking her downstream as she passes out. The next day, she wakes up on the river bank. After a brief walk through the woods, she comes across a dog named Sam, based on his collar. She follows him to a wrecked campsite where Sam had lived with his owners. Searching the camp, Clem manages to find a can of beans. Sam starts barking and Clementine sees a walker tied to a tree with a knife in its arm. presumably, he had tried to cut off the bite mark before he turned. Beating the Walkers head in with a branch, Clementine retrieves the knife and opens the can to dig in. Sam starts begging and, after a decision on whether or not to share, attacks Clem, biting her arm. Grabbing the knife, Clem stabs Sam and kicks him off her, accidentally piercing him on a metal tent frame. Clementine has the choice of putting the poor dog out of its misery or leaving it to die before moving on. As she walks through the forest, Clementine begins to feel weaker and weaker due to exhaustion and blood loss. Before she passes out completely she realizes she's completely surrounded by Walkers. She's rescued by survivors Luke and Pete, who begin to take her back to their camp. Once they see the bite Sam gave Clem, though, they freak out, thinking its a walker bite. Clem tells them it was a dog bite, but they're still skeptical. Pete gives her the benefit of the doubt and says they'll have their doctor take a look at her. On the way, Clementine finally passes out. As she stirs, she sees other people around her, arguing with Luke and Pete over their decision to bring her there, all of them believing she has been bitten by a walker. As she stirs, one of the survivors, Pete's nephew Nick, is startled and accidentally discharges his rifle, the bullet hitting the ground inches from Clementine. After more arguments, Clementine is looked at by the groups doctor, Carlos, who is still unable to determine what type of bite it is. After more arguing, the group decides to hold Clementine in a shed until the next morning, where Clementine will have turned if she had been bitten by a Walker. Of course they refuse to clean and stitch Clem's wound, saying they don't want to waste supplies on a potentially infected person. Asshats. Again, more problems with this, but I'll leave that for later. Clem decides to take the supplies and stitch herself up. She finds fishing wire in a tackle box in the shed, and manages to sneak out through a small hole in the side of the shed. Sneaking up to the house, she is able to appeal to a man named Alvin's humanity. He finds her a roll of bandages. Clem then sneaks into the cabin through a trap door under the patio. She finds a needle in the upstairs bathroom, where she overhears one of the survivors, Rebecca, noticeably pregnant, distressed over the identity of her babies father, whether it was her husband Alvin or someone else. She is then caught sneaking into one of the bedrooms by Carlos' daughter Sarah. Clem is able to manipulate her into giving her a bottle of peroxide. Returning to the shed, in perhaps the most cringe worthy sequence in the either game so far, she cleans the wound and sews it up. As she's dressing the wound with the bandages, she accidentally drops them. Reaching for them, Clem is attacked by a walker through the hole she used to escape. After she kills it, the shed door opens and the group walks in. After arguing (AGAIN) they bring her inside, where Carlos checks arm and then bandages it, saying she should be fine. Luke gives her some food and they talk about the past. Nick enters and asks for Clem's forgiveness. After Clem gives or denies it, they tell her about Nick's mom, who was bitten by a bite victim they had tried to save before. 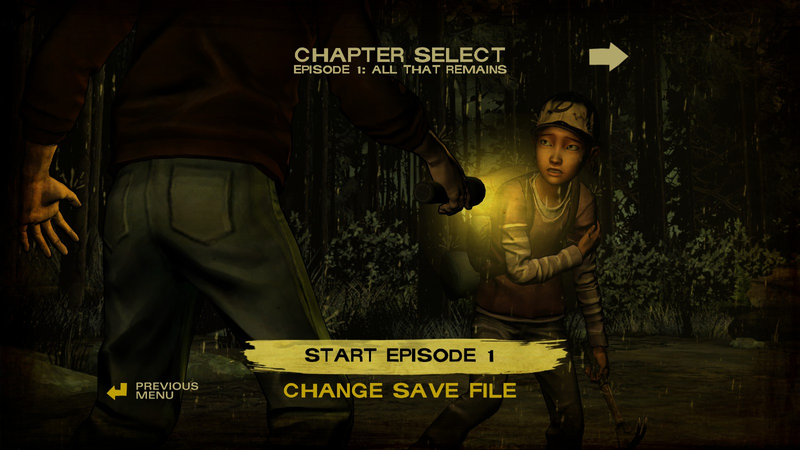 After they leave, Rebecca enters and all but threatens Clementine to leave. Clementine is given the option to tell Rebecca she knows about her baby dilemma. The next day, Clem joins Pete and Nick to check on the fish traps by the river. When they arrive, they see a number of fresh corpses on the river bank. Pete refers to someone named Carver, who he thinks is responsible for it. While checking the bodies for more information, Clem finds her old backpack that she was forced to leave behind at the beginning of the episode. She sees the nearby person is alive. She realizes that it's the other bandit who had chased after Christa. She asks about Christa, but the bandit just asks for water. After giving him some or refusing it, walkers begin to come from the woods, quickly surrounding Pete and Nick. Pete is attacked and bitten on the ankle. At this point Clem is forced to choose between saving Nick or Pete. If she saves Nick, Pete is overrun and killed by walkers. If she saves Pete, Nick runs off into the woods to avoid the walkers. Either way, Clem runs off with the person she saves in to the woods. These are my own, but so far it seems like most people chose the same. Did you accept Nick's apology? Did you save Nick or Pete? Sarah is nice enough, although she does seem ... off. I think, based on her actions and how her father acts about her, they're trying to hint at the fact that she may be slightly mentally handicapped. At least, that's the impression I got. Carlos seems like a good person too, just one that has only a single goal in mind; to protect his daughter from the horrors of the world, almost to the point of being irrational about it. I think eventually that will reach a breaking point, and I'm interested to see how it plays out. Rebecca.... man I hate her. She's the new Larry, essentially, just without the "He's doing it for his daughter" excuse. Nope, this is a person who is totally out for herself and will do anything that benefits her, no matter what or who is in her way. I honestly feel bad for Alvin. It may have been rash, but when the decision came up to let her know that Clem knew about her baby dilemma, I took it, and I really hope I get to use it to make her fall in line. I like the idea of playing as Clementine, seeing her continue to grow from the lessons she learned from Lee. But damn if she doesn't act a little ..... too mature at times. I understand having to grow up quickly in this kind of world, but I don't know. I do like how Clementine uses her age to her advantage, manipulating people into seeing her as a non threat or someone they should be helping. Why head north? I would think it would be better not to be in the freezing cold weather where a Walker could be buried under the snow anywhere, just waiting for an unsuspecting human to come around. I don't know about medicine, but it seems to me Clem would bleed out if she kept such a gaping wound open for so long. And even if she didn't, I think it would have been infected before morning as well. And really, how many supplies would have been lost by sewing her up? Some thread and a tiny amount of peroxide (certainly much less then she used and then spilled)? Is that how little a person's life is in this world? Poor Sam. I honestly had to stop playing for a bit after that and just play with my dogs. You know, Telltale, you could have ripped out our hearts better by letting him live for a few episodes. Seriously, I want to know what happened to Christa's baby. It's obvious it died, but did it die in childbirth or later on? Next up is Episode 2, A House Divided due out whenever the hell Telltale get's it done. Is it just me, or is that guy with the binoculars Vince from 400 days? Hopefully we see what happened with that group. And based on the preview for episode 2, someone else from Clem's past shows up. Who it could be, who knows? Most likely answer is Christa, but there is a chance it could be Kenny (who we never saw actually die) or Molly too.